What is a typical acoustic guitar made of? Maybe a spruce top with mahogany back and sides, a maple neck and rosewood fingerboard, micarta nut and saddle, plastic position markers and nickel plated steel frets. There’s also subtle, unseen materials such as the truss rod, the kerfing and the braces. What about the type of glue used or the type of finish applied. Pickguard, bridge pins and probably more. Is a cedar top better than spruce? What is select spruce? Let’s see if I can make a bit of sense of acoustic guitar materials. Before going further, I want to mention something about construction methods. Traditional instruments are built of all solid woods. Laminated woods – think plywood – are poor choices for guitar tops because the lamination inhibits vibrations. That means less sound – thinner sound – not good acoustically. Cheap guitars use laminated wood to keep prices low. However, dampening vibrations might be a good thing in an acoustic-electric guitar which will mostly be played amplified. Vibrations of the top can lead to feedback in electric guitars. Thus, laminated tops in acoustic-electric guitars might be preferred. The body of a guitar – the back and sides – do not need to vibrate as much as the top. Although the wood that makes the body can color the sound of a guitar, the body mostly reflects the sound. Laminated wood for the backs and sides of an acoustic guitar is a good way to hold down costs for low to mid priced instruments. High end instruments will still be build of solid woods. The neck of a guitar must be straight and resistant to twisting and warping. Solid mahogany necks do this well. Solid maple is not so good for necks because it is too likely to twist and warp. Electric guitar manufacturers learned that laminating strips of maple lengthwise, each piece in the opposite direction, could stabilize the wood so it could serve as a neck. All that said, unless noted, the rest of this article assumes we are talking about solid woods used in a completely acoustic guitar. I am not a craftsman nor a luthier. I am no expert on woods. But if you read about guitars you may become confused about what type of wood was used to build any particular instrument. A guitar may have a spruce top and mahogany sides and a maple neck with a rosewood fingerboard, but is that specific enough? Here’s a little lesson in woods. Spruce is the traditional top wood for acoustic guitars. The species of spruce is highly dependent on availability. European luthiers are probably going to choose varieties that grow close by – or at least somewhere on the continent of Europe. Early in the 20th century, Martin used Adirondack Spruce because it was plentiful and close to their headquarters in Nazareth Pennsylvania. The most used Spruce today appears to be Sitka spruce, a variety abundant in Western North America. Sitka (Picea sitchensis) comes from the northwestern United States and southwestern Canada. The Cedar used for guitar tops is usually Western Red Cedar (Thuja plicata). It is more popular in classical guitars than in steel string acoustic guitars but is being used in both. The sound of guitars built with Cedar tops is often described as being warmer than Spruce. Also, Spruce topped guitars need some time to “open up” – that is, the sound improves with age and playing, while Cedar topped guitars generally sound good to begin with, but their sound does not appreciably improve with age. Mahogany might not be considered a traditional top wood although it is a common and traditional wood for guitar necks and bodies. However, considering the long history of mahogany topped guitars from Martin and other – going back at least to the early 20th century, I’ll list it here. Understand it is not a common wood for instrument tops. Mahogany includes wood from a variety of related species. West Indian or Cuban mahogany (Swietenia mahagoni). This was the original species of mahogany. Honduras mahogany (Swietenia macrophylla). This is a related species and came to be known as mahogany also. Both of above from Meliaceae family. Both species are on endangered species lists and are banned by CITES 1 if they are from native locations. Crosses of the above two species introduced to plantations in India, Fiji, Bangladesh, and Indonesia can legally be harvested and sold as mahogany. There are a number of other members of Meliaceae which are related and sold as mahogany. You may see the wood for some guitar tops or bodies described as being African mahogany or Saple mahogany. Sapele (Entandrophragma cylindricum) is also of the Meliaceae family. Another wood, also sometimes described as African mahoganyis from the genus Khaya which is a member of the Meliaceae family. It includes seven species. However, it is not currently used in guitar construction. Koa (Acacia koa ) from Hawaii. Koa is similar in tone to mahogany and has been a traditional wood for ukuleles. Guitars have also been built using koa for the back and sides, and like mahogany, occasionally for the top wood as well. Maple is the traditional wood the bodies of violins and other traditional and classical instruments including mandolins. It can be found in various figured specimens which are prized for their looks. These include curly, flamed and quilted figures. Less common on guitars but also seen are fiddleback, and blistered appearance. The types of figures seen are somewhat dependent on how the lumber is sawn. Curly maple is seen more often in quartersawn wood while birdseye is more often seen in flat sawn lumber. Maple body guitars are usually said to produce a tone between that of rosewood and mahogany. Rock Maple (Acer glabrum) is from Western North America. European Maple (Acer pseudoplatanus) AKA Sycamore or Sycamore Maple. Bigleaf Maple (Acer macrophyllum) from Pacific Coast of the United States. Rosewood is used both for bodies and for fingerboards. Brazilian rosewood is banned by CITES unless it has proper documentation. Brazilian Rosewood (Dalbergia nigra). Endangered and CITES listed. (East) Indian Rosewood (Dalbergia latifolia). Cocobolo (Dalbergia retusa). Pacific coast of Mexico and Central America. Ebony is a harder fingerboard material than rosewood. The deep black ebony fingerboards one is used to seeing on guitars may be natural, but is often stained to cover natural variations in the wood. Ebony is sometimes also used for archtop guitar tailpieces and as a top layer on the headstock. Straight grains are preferred for most uses, particularly tops. This partly an aesthetic preference, though there is probably some relation to tone and strength as well. Narrow grains (comparing the same species) are stronger or stiffer (less flexible) than wider grains. This affects the tones produced in top woods such that the trebles are emphasized in narrow grains while bass is emphasized in wider grains. Koa and Mahogany are hardwoods. Tops made from these woods emphasize the midrange. In general, denser woods put more emphasis on the bass. Mahogany is the least dense hardwood. Taylor and Martin are both excellent guitar makers and their models are a great way to compare the effect of body shape or wood selection on tone. Both makers have standardized body shapes and model series where you can compare several guitars that are identical except for, say the wood used for the back and sides. Even with this, beware that the comparisons are tricky because sometimes two identical models, including woods, sound different. Maybe one is been played more or is older, or maybe it’s just due to differences in the specific pieces of wood that went into the guitar. Rosewood is the densest wood which gives more bass while mahogany is the least dense and has better midrange tones. The other woods have tones that are between rosewood and mahogany. See All About Top Woods and Tone woods for more information. Most quality guitar woods are obtained from quartersawn lumber. What does that mean? 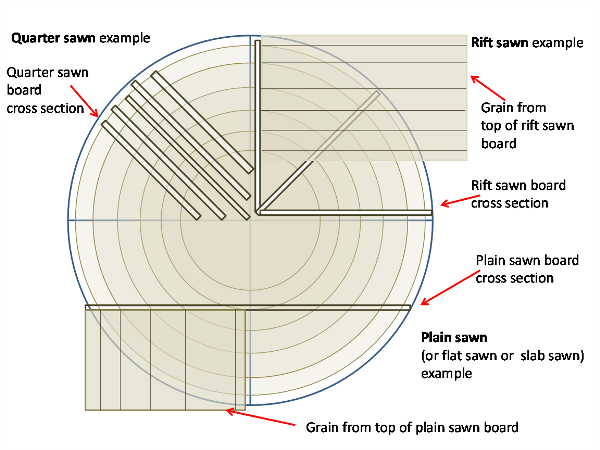 The following illustration of a cross section of a log attempts to give a crude idea of several types of cuts and their affect on grain. The optimum cut for tight, evenly spaced grain is rift sawn wood. Each board is essentially cut radially from the center. All the boards should have similar grain patterns. However, it is difficult to cut and very wasteful. Not shown in the illustration are the number pieces that end up as wedges or useless scraps. Quarter sawn lumber is the compromise cut used by most for quality woods. It is less wasteful while still producing good grain. The Top Left illustration is again highly simplified. In reality there would probably be section within the quarter shown where the cuts are made at 90 degrees and at 180 degrees. There is still waste. Plain, flat or slab sawn lumber is shown in the bottom half of the illustration. Notice how the resulting grain is not evenly spaced with the widest grain in the center of each board. However, a cut through the center of the log will produce the same grain as quarter sawn or rift sawn lumber. Guitar tops are often advertised as being AA or AAA grade spruce. Although most luthiers grade their wood, there is no standard. What might be called AA by one company could be AAA for another. Even the term “select” is inconsistently used. Be wary of buying a guitar with a top labeled select. If it doesn’t say it is a solid top, it probably isn’t. Many low end guitars use the term select to designate laminated tops. Yet, some companies actually label solid tops (but of a low grade) as select. So be careful. Old World Tonewood Co., About the wood. Timbre Tonewood. Grading Sikta Spruce. CITES: Convention on International Trade in Endangered Species of Wild Fauna and Flora, also known as the Washington Convention. Previous Post:What are guitars made of?